Over the last little while since you found out you were expecting Baby L, you and I have had a lot of conversations centering on pregnancy, labor, birth, parenting, diapering, anxiety, postpartum and feeding. Most of the things we discuss we are pretty much on the same page and I can offer you my experiences and thoughts. Except one. There is one choice you are making that I never did. And that’s to breastfeed. I don’t think there is anything wrong with it. In fact I fully one hundred million percent support you in that choice. And I want to see you succeed. I want to help you succeed. I want to be there for you when you are struggling, and I want you to be able to count on me for support in any and all circumstances. At first I wasn’t sure how I could help you. I can’t relate to anything you are going to be experiencing and, in fact, I don’t even know what I can do that would be helpful vs what isn’t especially helpful. But then I realized, I started blogging back in January and so many of the blogs I read touch on breastfeeding! So, I turned to the wonderful women I have been reading about to give me (and you) some tips/pointers and share their experiences. I hope to see you and Baby L have a happy feeding relationship, and I want to be there for you every step of the way. 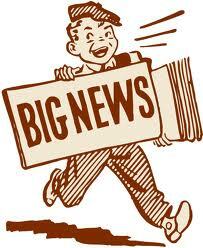 Over the next week or so I am going to be sharing the stories and tips that have been so graciously shared with me. I hope they help you on your journey. Valerie over at Atlanta Mom of Three shared a post she had written with me. Her post is titled Breastfeeding ROCKS! And in it she shares her experiences with breastfeeding as well as numerous links to websites and blogs to help out in a number of situations. The second post I really hope you check out was written by Shannon at A Game of Diapers. She wrote a post called Tips for How to Win at Breastfeeding: What the Books Don’t Tell You. It is a very well written post, that was dedicated to me, for this project. I have received a large number of contributions to this project since I put it out that I was looking for help. And I plan to share each and every story that was (and may still be) shared with me. I hope you find information that helps you on your journey. As we all know, I am a formula feeding Momma. I didn’t even attempt breastfeeding. Now one of my closest and dearest friends is about to become a Momma. And she is planning on breastfeeding. I want to support her as best I can, but let’s face it, I have no sweet clue what the best way to support her in this journey are. As part of World Breastfeeding Week, Suzanne Barstone of Fearless Formula Feeder, Kim Simon of Mama By The Bay and Jamie Lynne Grumet of I Am Not the Babysitter are encouraging all mom’s to stand up and say ‘I support you’ to all other moms regardless of their feeding choices. The “I Support You” movement aims: 1) To bridge the gap between formula-feeding and breastfeeding parents by fostering friendships and interactions. 2) To dispel common myths and misperceptions about formula feeding and breastfeeding, by asking parents to share their stories, and really listening to the truth of their experiences. 3) To provide information and support to parents as they make decisions about how to feed their children. 4) To connect parents with local resources, mentors, and friends who are feeding their children in similar ways. As part of the ‘I support you’ movement, these wonderful women are encourage fellow bloggers to interview their ‘opposites’ and participate in a blog hop. As an exclusively formula-feeding momma, I chose to do two interviews. I chose to interview Elise of Persephone: Parent, an exclusively breast-feeding momma to Baby E and Jaclyn, a momma who breastfed her two daughters T and K for different lengths of time and had two different experiences. 1) What was your original plan for feeding your child? How does that compare with how you are currently feeding your child? I always planned to breastfeed. Or hoped to, anyway. It was a bit rocky in the first few weeks where I did give my son a few bottles of formula, but with the help of fellow bloggers I stuck it out! 2) What is the best part of how you feed your child? The worst? Cynically, the best part is it’s free and easy now. I don’t have to remember to sterilise bottles, buy formula or take some with me when we go out. If I forget to buy dinner, we order a take away. I couldn’t do that for baby Elvis. The worst part is sometimes finding places to feed. Just yesterday I went somewhere new in town on my own. I found some public toilets with a baby change room. The room was dirty and there was no lock, but it was too cold to do it outside. If I bottle fed, it would have been easier to find a place when I was alone without prying eyes! Another bad thing is that apparently formula fed babies sleep longer overnight and sooner. I’d loooove more sleep! 3) What judgements on how you feed your child are the most hurtful? I don’t think I’ve experienced anything really hurtful. Breastfeeding is very much encouraged in England. I did have a MIL ask if I was breastfeeding purely to lose weight. Uh, no! 4) Do you feel that you were supported in your choice? Yes. Incredibly so. My husband made it clear he wanted me to breastfeed, but would have supported me if I had a true reason to give up. He knows exactly when to push me, when not to and we tend to both agree on many things. My mum never breastfed me, but my cousin did her 3 boys and whilst we’re not exactly close I sent her plenty of tearful texts in the first few weeks which she responded to immediately! 5) What would help you to feel supported/understood in your choice? 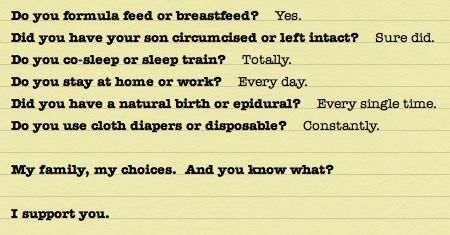 I feel perfectly supported in my choice, but would have preferred different support in the hospital after I gave birth. I really didn’t enjoy my post natal hospital stay or the staff! 6) Think 20 years into the future. If you could give your child one message about how you chose to feed him, what would it be? Now if I’d had a daughter I’d like to think I could be really supportive to her! I’ll tell him that, at the time (because professionals are always changing their mind!) breast milk was “the best” for him and that I stuck it out for as long as was best/I could. I tried to do my best for him from before even day one! 1) What was your original plan for feeding each of your children? How did that compare with how you fed them? With both girls I had full intentions of breastfeeding both. Both pregnancies were induced and rough labours, second ending in a csection, both leading to a 5 day delay in my milk coming in. With my first I did for about 6 weeks at that point I switched her to formula as I felt she wasn’t getting enough and my milk supply was dwindling. With my second I was able to breastfeed no problem for 7 months. 2) What is the best part of how you fed each of your children? The worst? The best part about formula feeding my first was that my husband was able to have a strong bond with her as we took turns doing night feeds. With my second her and I had a stronger bond as it was just me feeding her. The worst with my first was we didn’t have as strong of a mother daughter bond I had anticipated as dad was doing feeding just as much, with my second it was hard during the summer. She would cry from the being hungry but too hot to feed. Took a while but she was able to drink breastmilk from a bottle. 3) What judgements on each way of feeding were the most hurtful? With both there wasn’t any personal judgement on formula or breastfeeding. The only judgement I received was from different facebook groups saying one was better than the other. 4) Do you feel that you were supported in your choices? The only support I had in breastfeeding with my first was my husband and my family. With my second I had a lot more supportive friends around which was a huge encouragement and a big reason I feel my milk didn’t dwindle like the first time. 5) What would help you to feel supported/understood in your choices? 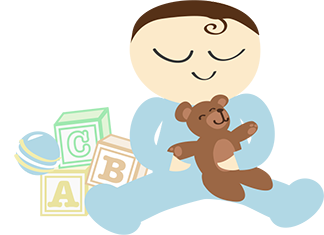 A way to help people feel supported in either formula or breastfeeding is to have an understanding that you are doing what’s best for your child. One of my closest friends personally didn’t like breastfeeding but she didn’t care that I did. She knew that’s what i preferred just like I knew she preferred formula. If there was a bigger acceptance of both that would be the best support. 6) Think 20 years into the future. If you could give your children one message about how you chose to feed them, what would it be? My message to my girls in the future is to do what they feel most comfortable with. Seek help and understanding if they are not aware so they can make the best choice for them and their children. It makes me happy that both of the women I chose to interview as my opposites had such a positive experience. To both of them I say ‘I support you.’ To all the moms out there who choose to breastfeed. I support you. 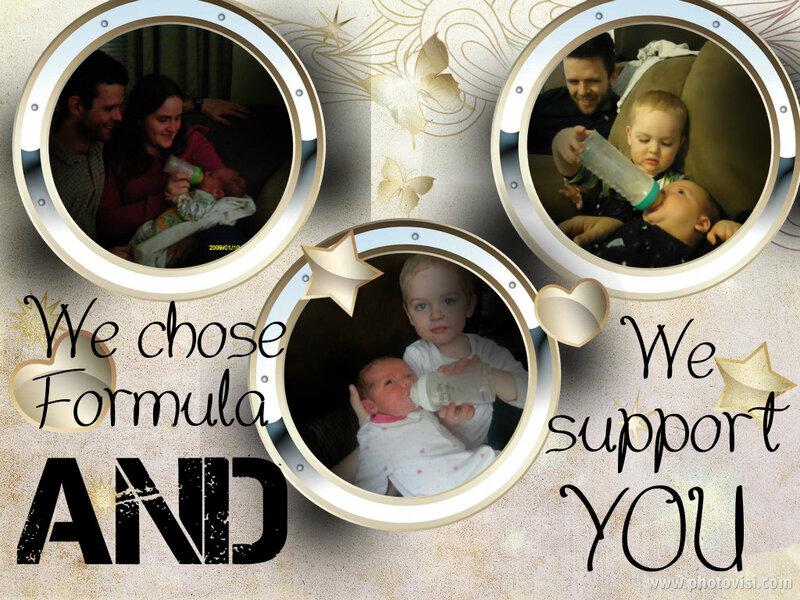 To all the moms who choose formula. I support you. To all the moms out there who need to change their plan and find something new that works. I support you. I support all moms and all feeding choices. Why? Because ultimately as long as our babies are fed, loved, healthy and growing, there can be no wrong way. I am lucky that I was also one of the lucky ones who didn’t face a lot of judgement for my choices. The people who did judge me for it, weren’t important in my life and for the most part it was easy to remember why I made the choices I did. Seeing my babies growing, thriving and healthy definitely helped me through that. I hope that all Moms can remember that we are all doing the best we can. I don’t know about the rest of you, but my babies didn’t come with a handbook. We need to continue encouraging and supporting one another. Normally I don’t pay too much attention to any of this stuff. I see it, I let it go. I have been judged for how I feed the kids, but I let it go. Well, seeing it all over the internet/facebook/the news, it has been on my mind a little more. Yesterday I was out with the kids. We took them to the mall. In the mall there is this cute little play place for the kids to play. Zoey was due for a feeding, so I figured the boys could play and hubs and I could sit on a bench and feed Zoey while we watch them. So I send the boys off to play, and sit down. A few feet to my left is a woman who apparently had the same thought as me. She sent her older child to go play while she breastfed her baby. Seeing her breastfeed bugged me a little bit. Not in the ‘ew that’s disgusting kind of way’ I don’t think breastfeeding is gross in any way, but in the way that I was about to whip out a bottle of water and some powder to mix up some formula for my baby. I was worried she was going to judge me. That way of thinking is not like me at all. I am normally the one daring people to judge me. I am normally the one willing to stand up for myself and others. But I was honestly fearful of what this woman that I had never met was going to think about me giving my baby formula. But Zoey was getting fussy so I had no choice but to mix her formula and give her her bottle. I couldn’t make the kids leave the play area. That wouldn’t be fair. Deep breath. So I pulled out the stuff I needed to make her a bottle. And I prepped it. All while being super careful to avoid eye contact with breastfeeding Momma. Then I picked Zoey up and started feeding her, looking only at her and the boys. Still refusing to make eye contact. Then I hear a voice. ‘I love her headband. Did you make it?’ What?!? Breastfeeding Momma is making conversation with me.. well I can’t be rude… So I answered that I had indeed made it and we talked about crocheting and the different projects each of us had done. Then we talked about our kids. And you know what? It wasn’t awkward. Not even a little bit. It was perfectly fine. Neither of us cared that we were doing things differently. And that ladies and gents, is what being supportive is all about. This picture was uploaded onto the End the Mommy Wars group on Facebook by Annie Vorys and I think it is perfect!